Place the avocado flesh in a bowl (we used a mortar and pestle) and mash with a fork. Add the juice of fresh lime immediately to prevent the avocados from browning. Add the remaining ingredients and gently mix all together. Adjust to your taste. Serve immediately or cover with plastic and refrigerate until ready to serve. Garnish with cilantro and sprinkle with matcha powder. Serve with tortilla chips or as a sauce, or vegetable dip. 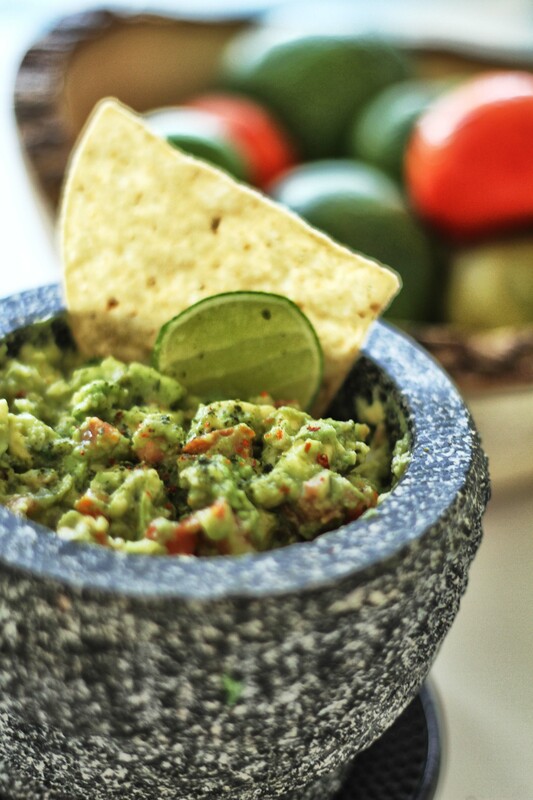 This guacamole is quite chunky and creamy in texture. Others may prefer to use a food processor or blender for a smooth, extremely creamy dip. There is really no need for mayo, sour cream or other additives. Just use fresh ingredients. Also, if serving guacamole with tortilla chips, leave the guacamole under salted, as most tortilla chips are already salted. We’ve used 3 tsp of culinary grade matcha for this recipe. However, when mixed with dominant flavors such as garlic, onions and cilantro, the matcha becomes extremely subtle. You may certainly add more, to your liking. Consider it for its health benefits rather than its taste. Overall, we love experimenting and finding ways to incorporate tea in food. If you do make this, let us see!☺ Tag your photo and share with #yvetteteas on Instagram.